Written by: KristaG on March 4, 2018. 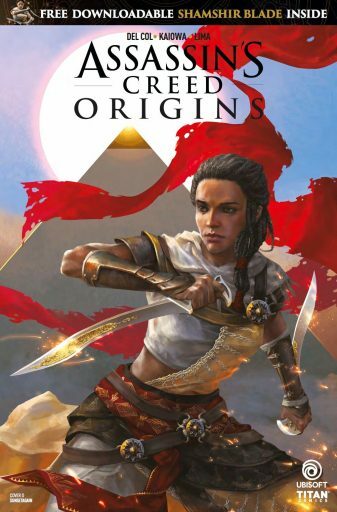 As someone who has logged in around 100 hours (give or take a few hours) of Ubisoft‘s Assassin’s Creed Origins since it’s initial release on October 27th, 2017, I have been looking forward to this new mini-series from Titan Comics from the day it was originally announced. 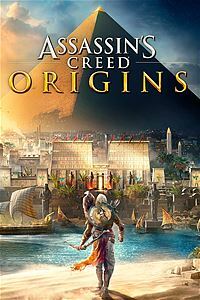 The game itself is a bit of a reboot for the Assassin’s Creed franchise taking players back to the declining years of the Ptolemaic Dynasty in Egypt (around 49-47 BC) at a time before the Assassin Brotherhood and even the infamous Creed were ever established (hence the title of “Origins”). With this 10th major installment of the action-adventure franchise also comes some new, heavily reworked gameplay, a more immersive world than ever before, and, of course, a slew of new characters and their amazing stories. 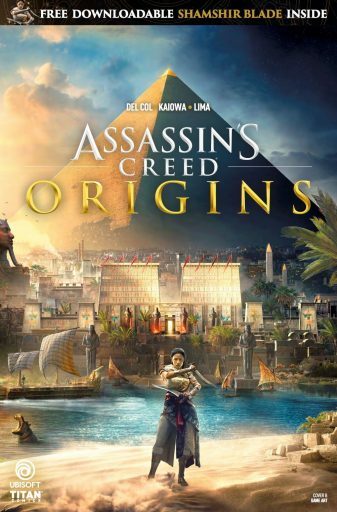 The video game centers on a character named Bayek who is a Medjay working to protect the people of Egypt during the political upheaval stemming from the various coups and counter-coups between Cleopatra and her brother Ptolemy XIII as well as the numerous invasions by the Romans. Bayek, himself, however, also has far more personal reasons for joining the fight alongside his wife, Aya (a Greco-Egyptian agent to Cleopatra and co-founder of The Hidden Ones). Assassin’s Creed Origins #1 is scheduled to be hitting the shelves on March 7th, 2018 and will also come with a code to get an exclusive new weapon – a shamshir – in the game! Instead of featuring Bayek and any one of his numerous accomplishments, Assassin’s Creed Origins #1 focuses on Aya and what happens to her after she leaves Egypt. The story opens with Cleopatra during a fatal interrogation of a female agent of Octavian. After said agent’s death, Cleopatra states that she is reminded of another brave woman she once knew who not only challenged her, but had also earned her respect. Shifting focus from Alexandria, Egypt in 30 BC to Rome 14 years prior, the story now centers on Aya, wife of Bayek of Siwa, and the events surrounding the assassination of Julius Caesar. Once the assassination is complete, Aya realizes that perhaps Brutus was wrong about the effect Caesar’s death would have on Rome and that Mark Antony is correct in his ominous warning. PJ Kaiowa, who also worked on Pacific Rim: Tales from Year Zero from Legendary Comics, joins the ever-growing list of artists who have drawn Assassin’s Creed comics. Though I really enjoyed Kaiowa’s style and attention to detail on the numerous splash pages in the comic, I felt that the artwork got a little “muddied” during other panels. There were some scenes, for example, where it was hard to discern which characters were which and would have been impossible were it not for the inclusion of some of their iconic gear (such as Aya’s weapons, sashes, and other specific articles of clothing in some cases). I was also surprised by the lack of blood in the comic. Though the video game maintains a good balance between realism and straight up carnage, it definitely does not shy away from using a little blood to emphasize what’s going on in the story. There were a few scenes in the comic that, in my opinion, could have used a little blood to get the point across of what was going on. I do feel, however, that Kaiowa does an amazing job with being able to replicate and produce various types of scenery. As this is a comic inspired by a game that tends to frequently jump locations and timelines, I feel it is crucial for the artist to be able to portray those differences as well as be able to do action scenes – especially with something like this! As I have not seen much of Kaiowa’s work prior to this comic other than a few sketches that were posted online, I’d like to see more from him before I make a more solid opinion on if I like him as an artist or not for this project. Author Anthony Del Col, however, is not a stranger to the Assassin’s Creed franchise when it comes to the games or the comics. His love of the franchise is seen in his previous titles (Assassin’s Creed: Assassins #1-14, all published by Titan Comics) as well as in the letter he leaves for his readers at the end of the Assassin’s Creed Origins #1 comic. He is credited with creating the first female lead for Assassin’s Creed (Charlotte de la Cruz), but I feel many forget about Aveline de Grandpré from Assassin’s Creed: Liberation that came out in 2012 (2 years prior to the release of the comic). The story of Assassin’s Creed Origins #1 seems to stay true to the storytelling style that players of the game would recognize and, in that regard, is really well written. Del Col’s portrayal of Aya was very true to character in the game; showing her to be strong, smart, skilled, and dedicated. 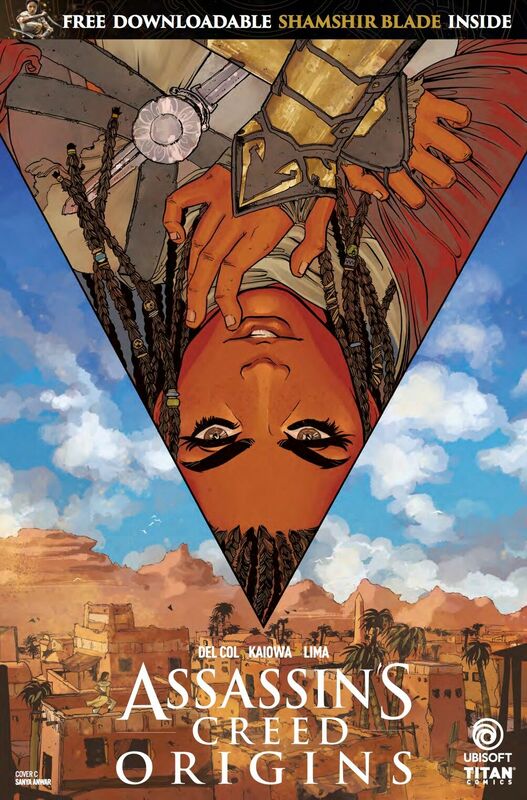 Since the comic began with Cleopatra and then switched to Aya as the main character, I am curious what direction the actual storyline will be taking in later issues. Will it continue with Aya or will it focus mainly on Cleopatra now that Julius Caesar is dead and Octavian is at war with Cleopatra and Mark Antony? Will we perhaps see Layla (the former Abstergo employee who uses her portable Animus to access Bayek and Aya’s memories in the game) make an appearance at some point? All of these are questions I would love to have answers to and have me enticed enough to want to continue with the series! It has been long joked about by my friends and coworkers that I live and breathe the Assassin’s Creed franchise – they are not exactly wrong, either – so once it was announced that there was going to be a new mini-series added to Titan Comics’ extensive list of Assassin’s Creed publications, I knew I would have look into it! Overall, I’m fairly pleased with it. The plot, as I stated before, falls into place with the world that the video game has built and uses easily recognizable characters to continue the story. I feel the ending of this issue was left with a lot of room for speculation as to what will come next as well as quite a few possibilities. With new updates and downloadable content (including story expansions) coming to the game on a fairly regular basis right now, I am curious about this possibly having an effect on the comic series later on. 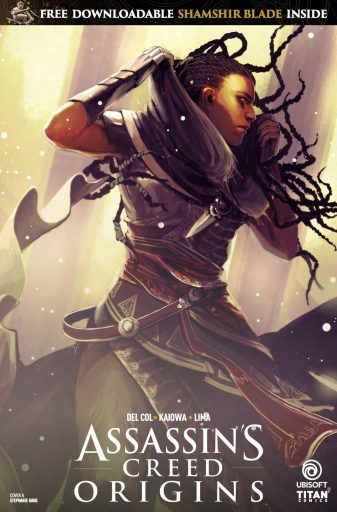 I’m also curious to see if we ever see Bayek make an appearance in the comic or if it is going to focus more heavily on the women of this franchise? I feel either option will still make for a great story!